No meter? No traits? No problem. 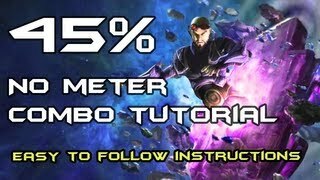 Watch TrU3Ta1ent's 45-percent General Zod combo video with notations inside. In a world with meter and traits, TrU3Ta1ent has decided to ditch them in this new Injustice: Gods Among Us combo. The shining star here is Superman's arch-enemy General Zod. The video features notations for the 45-percent combo.